This class will explore and discuss the different views as to if and how the 9 virtues as we know of them today where taught to people of old. We will also explore what these virtues are and their meanings. As well as why they are important in today’s culture and how to use them into our everyday life. This is the advanced class of grounding, centering and shielding. It will teach concepts of geometric shields. How to hide a shield in plain sight, and how you can ground in elements other than earth. Join the discussion on Chaos magic and Ordered magic. Learn what separates and what defines them. Investigate what joins them together and creates the balance of creative and detructive energies. How does consent function in Pagan rituals? How much warning do you owe participants, especially if there is a function of mystery or surprise as part of the rite? How can you raise energy without making anyone feel left out, awkward, or pressured to participate? How do we make ritual accessible to people with disabilities, and what about when one person’s needs clash with another’s? This class and discussion group will ask these hard questions, and give the tips and solutions we’ve found most useful in our Pagan church. You’ve got no Tarot Cards, Runes, Pendulum, or anything else on you, but you need to tap into the universe. No problem. You can do a wonderful reading using the credit cards in your wallet, pebbles on the ground, whatever is available. We’ll explore how you can come up with a dozen ways on the spot. Turn your view of ancient Egyptian magic on its ear–instead of going over list after list of “this is what this amulet does and this is what color it should be”, look at Egyptian magic the way the Egyptians looked at it: as a dynamic part of their everyday lives. Via a series of vignettes depicting problems and solutions. Along the way, we’ll discover many magical practices that will seem very familiar. Doing readings for others can be fun and enlightening, but it can also be a great responsibility. We will discuss some suggested do’s and don’ts, as well as what your client should expect from you (and the other way ‘round, too!). E.D.C. or every day carry refers to a kit that is carried in pocket, purse, backpack, or briefcase and is avalible at all times. While usually this refers to a survival kit or escape kit, this principal can be applied to people in the spiritual/magical/metaphysical community. Starwolf will discuss how to create a kit that will “hopefully” fit your needs. If you already have a kit or have started one, bring it along to show off. Note we will NOT be discussing concealed carry firearms or the proper caliber of silver bullets. Various energy healing techniques which you can use to heal with no tools. Includes acupressure, Reiki, RunValdr, Dynamind, Quantum Touch, Silva Mind control, Theraputic Touch, Polarity, as well as covering chakras, and meridian theory. The virtue of Hospitality is far more than being a good host/hostess. We will begin our class with discussing how hospitality was done by our ancestors and then move into ways of using the skill of hospitality in things we do today. This class will include not just what it means to be a good host/hostess but also how to be a good guest as well as how to serve our family, friends and community in ways that benefit everyone involved including ourselves. What do the calendar derived by Robert Graves from the Irish/Cymric tree ogham, the putative Essine calendar derived by Mockingbird from the Book of Jubilees, and the “Chinese Zodiac” have in common? This workshop will return to the notions of the symbolism involved in the construction of calendars. If you know of a significant (preferably old) calendrical system,bring it to the attention of the group and we will attempt to analyze it. Have you ever wanted to create your own tarot spreads? Did you ever feel that the more traditional spreads like the Celtic Cross or Past/Present/Future did not address information you were seeking? This workshop designed for intermediate to advanced tarot students will help you to create accurate, beautiful, and intriguing spreads for yourself, friends, and clients. Bring your favorite deck, a notebook filled with symbols you like and questions you would like answered, and get ready to create some exciting new divination tools! 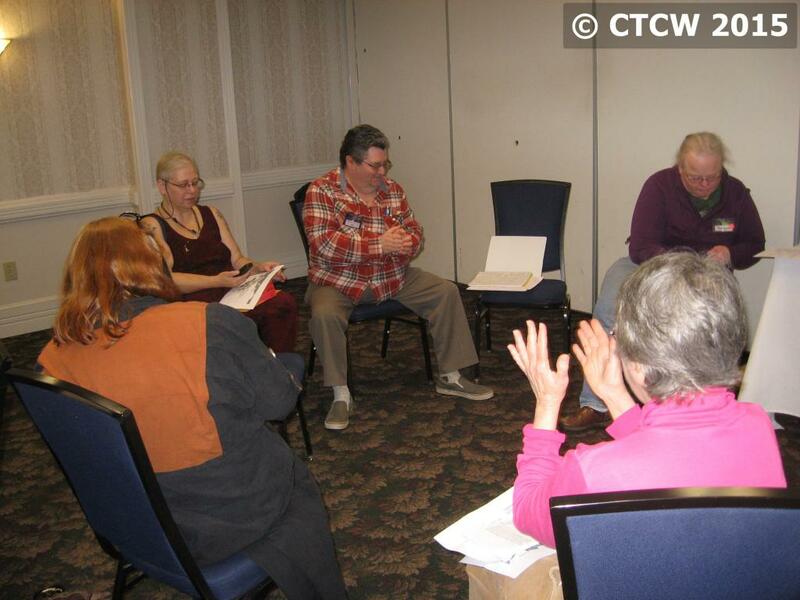 This workshop assumes the participant knows the meanings of all 78 cards and is familiar with the Celtic Cross spread. Kala is the Sacred Rite of Unbinding as taught in the Feri and Reclaiming Traditions. Together we will perform this ritual and tap into the issues that keep us in knots, feel them deeply, and learn how to unbind ourselves. Bring your chalice or favorite mug, or we will provide you with a drinking vessel. Come to this panel ready to discuss leadership in your community! Based on my article “Walking the Walk: Leadership at Four Quarters Interfaith Sanctuary” which is featured in the book “The Pagan Leadership Anthology” we will discuss how leadership skills develop, particularly when raising a 6-ton megalith is involved. A power point featuring pretty pictures will serve as the backdrop for open discussion and question and answer about how leadership skills develop in an interfaith setting. Many psychics are also “helpers’’ or “healers”, so busy caring for others that they forget to nurture themselves. It’s good to help others, but it’s also important to live your dreams and take care of yourself. Join Cathy Kane to learn ways to strike that balance between the needs of others and your own, and have a happier, healthier life. “Stand Back! We’re Going to Do Science!” The paranormal is real, but much of our society doesn’t know that, because of lack of information on metaphysics and lack of proof that it’s real. Join Cathy for three simple, quick, fun experiments to examine and document how metaphysics works. Your personal results confidential, significant experiment data will be written up. Learn how to construct and use a simple pendulum. From the time we are born, each of us have guides from the spirit world, assigned to see us through our journey in this life. Sometimes, they change as the situations in our life do, sometimes they remain, helping us through difficult life situations, warning of danger, comforting us, and pointing us in the right direction. In this workshop, you will learn how to open yourself up, and to effectively communicate with your Spirit Guides. Learn their names, who they are, and what their role in your life is. You will learn about the four ways in which spirits communicate: Through dreams, telepathy, knowingness, and physical or audible manifestation, and how opening the lines of communication can enhance your life. From waking dreams, through deep slumber journeys; in trance and under enchantment the modern cunning person wanders not only between states of awareness, but also cultural landscapes. Cunning is as Cunning does. Throughout history it has been in the capability of the person of Cunning that the measure of their Cunning was defined. Whether they used Christian mysticism, Pagan magic, or just plain old laying on of hands, Cunnningfolk have been measured by their skill and efficacy of actually getting results. The word Cunnning itself gives us the sharpest insight into how this practice works. Join Jeffrey Cerneson as he explores a multicultural model of how one can influence events, change states of being, heal, alter perceptions, and potentially experience the world through the eyes of non-human persons; spirits of river and stream, forms of thought, dream beings and even perhaps non-local entities. In this workshop a consistent paradigm and method of development is presented that lays the foundation for a lifetime of exploration. We will discuss how one may awake the senses to the unseen, directly experience and work with the life force, alter consciousness at will, walk between states of being, and how to take fundamental practices and expand them into any Cunning Art or Craft one might like to follow. In the course of our exploration we can learn some things about the nature of human spiritual capacities in a grounded manner that makes sense of a multitude of cross cultural ideas and practices. This is a class on how to engineer awareness and direct it toward the functional application of non-ordinary states of being. In this workshop, we will examine the concepts of mythology in our modern day age, and what we have cllectively created as the archetypes of the American and world mythologies. Looking at everything from comic book characters to novels like American Gods, we will discuss what we have created in our culture as a olution to the lack of a solid religious mythology and explore why a cultural mythology has arisen in our midst at this time. This class will give you the tools on how to approach the beginning of a relationship, the way to maintain a good working relationship, and even how to end the relationship if you choose to. Guidelines for practitioners and clients for how to restore clients’ sense of normalcy after a haunting, curse, or possesion case has been resolved. This includes a basic overview of the trauma of paranormal attack, and tools for healing that trauma. Careful spell crafting involves time and preparation but sometimes the passion/energy of an immediate moment is too good to pass up. This workshop offers practical tips and tricks to conducting spell-work on the fly with minimal tools for maximum result. Spell components are available for minimal cost. Come learn hands-on techniques that you can use for attracting and circulating abundance and prosperity in your business, vending endeavors, office, and home. This workshop will teach you practical things that you can do to attract abundance, clear financial blockages, and understand how money is currency. We will take an elemental approach well. If you vend, bring your cash box, wallet, check book, purse, whatever you use for holding money. We will have a special cash box blessing for vendors. In the Eridu Genesis– a Sumerian document from around 1600 BCE–the goddess Ninma presents seven clay figurines to Enki, the decision-maker. Each figurine is gifted with a peculiar handicap, but Enki cleverly counters each of these proposed deficits. Our task will be to determine the (obvious) pattern behind the puzzles, and the ingenuity of Enki’s solutions. This ancient text is as good an introduction to the seven image complexes as “There was a crooked man”!Yes, there will be balance here, for Enki also presents a puzzle to Ninma. Have you ever done a reading for a child? Sometimes children need readings as much as adults do, but it takes special skills to do a successful child’s reading. Learn practical skills for doing children’s readings, including making a connection with a child, adjusting for attention span and level of understanding, special skills for reading for babies, and doing readings that children and their adults can both benefit from and enjoy. Taught by a professional reader with years of experience reading for children and babies (the youngest- 6 weeks old). Come prepared to learn and have fun. Some experience doing readings is helpful, but all levels of experience welcome. From the origin(s) of runes to the early Viking period, these characters have not only been used for mundane purposes (business correspondance and shipping labels, indicating ownership of jewelry etc.) but also for magic. We will explore both angles in this class, as well as the origins and meanings of the individual runes themselves. The A/S/F runes were primarily derived from the Scandinavian-Continental Germanic Elder Futhark, and have the earliest documented rune names. We will also explore St. Boniface’s Letters and other early rune codes. In the late Vendel or early Viking period, the rune row was condensed to a 16-character array from the earlier 24-rune Elder Futhark. We will look at not only rune names/meanings, but also dotted runes, “short-twig runes, “Norse code”, magic, and mundane usage in both Pagan and Christian usage. We will gather in sacred space to facilitate deep, sacred, heart healing for each other. This is not a “class”, but a sacred experience that we will gift to each other in safe and blessed space. We will offer sacred witnessing and we will all have an opportunity to be heard. This class is based on Dale Cannon’s book “Six Ways of Being Religious”, for a Pagan context. Are you most moved by group ritual, or do you prefer a private devotional relationship with your Gods? Are you a religious scholar who scrutinizes ancient sources or a mystic who hears divine messages? Do you serve your community by mediating with the spirits or by being the one who puts together the canned food drive? Whatever your path, it’s likely that people who are called to other paths don’t understand why this one calls to you. We’ll talk about the joys and pitfalls of each of these religious paths, and what happens when they clash with each other in Pagan religion. Do you use divination to make life decisions? If not, is that because you don’t trust it to actually work? This class and discussion group will focus on the place of divination in Pagan religion and in our lives, throughout religious history and crossing today’s attitudes. We’ll talk about diviner’s ethics – what does a diviner owe a client? What are best practices? How can diviners become trusted in their community, and what do we do when divination goes wrong? How good an idea is it to “second-guess” Fate anyway? Let’s talk about the thorny questions in the art of foretelling for a community of modern skeptics. Tarot cards can be a valuable tool for the fiction writer. Ever run into a recalcitrant character who just didn’t want to tell you what was going on in their heads, or get stuck on a plot point where you feel that the answer is just out of reach? Try using tarot to gain insights into your characters. We’ll discuss how to do a reading for a character, or to divine what might happen if you take the plot in one direction rather than another. Your characters are lurking in your subconscious, and the cards are just the tool to help you tease them into the open. The spiritual path is one that we walk all the days of our lives, but especially for those of us who have successful spiritual businesses, it can be easy to forget that we must continue to evolve, to make progress down our paths. In fact, for those of us working with large amounts of spiritual energy, it is imperative that we keep moving in order to maintain a healthy connection with the Divine so we do not harm our clients or ourselves. Each of us, even the most evolved of us, can benefit from a “reboot” in our spiritual practice as a means of refocusing our dedication to our mission, improving our communication with the Divine, and raising our energy. During this workshop, we will explore ways to shake up our routine, including new types of meditation, connecting with new faces of the Divine, and ways to “check in” with our own egos in order to best serve our clients and our Higher Power. All intuitive and energy practitioners are welcome. An exploration and discussion of the history of the human race. We will employ a generational timeline to mark the seminal (or Ootic?) events during the diaspora of (wy)Mankind. Our species has seen some profound changes in behavior and lifestyle during our life on earth. What impelled these changes?